Did you notice something different when you installed your Q1 2008 RadControls for ASP.NET AJAX? If you didn't, welcome to the RadControls! This was probably your first install and I hope you enjoyed it. If you have been with Telerik for a while, though, then you probably noticed that the ASP.NET AJAX installer has received a major face lift! The new installer is more than an attractive face lift, its performance has also be radically improved. Gone are the days of needlessly long installs and uninstalls. Everything now happens in 5 to 10 minutes (depending on your rig's setup). The new installer is hard to do justice in words alone, so I've gone the extra mile a prepared a complete, narrated photo gallery showing exactly what's new. If you're looking for yet another reason to upgrade to Q1 2008, check out my gallery and enjoy the beautiful new shots of the installer. The experience is elegant and fast and a great way to get started with the RadControls for ASP.NET AJAX. The WinForms and Reporting installers haven't received the visual punch that the ASP.NET AJAX installer got, but they have still been improved in the Q1 2008 release. We spent a lot of time over the last several months optimizing our installers as much as possible so that your first experience with every release is positive and fast. 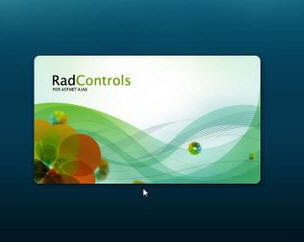 We want you to be able to get right to developing solutions with the RadControls as quickly as possible. Hopefully you enjoy the new installation wizards and see the results of our hard work. Let us know what you think. Todd, the new installer is pretty, but it's also positively awful. First, Installers that consume the full screen for the sake of a background image are supposed to be long-dead by now, because they get in the way of the user's desktop and applications. It shows a lack of respect for the user. It /has/ to go. Second, the "Configuring Visual Studio toolbox items" pop-up overlays itself on top of whatever application you're using at the time. It has no chrome and cannot be moved, which is bad UI. This message should be displayed inside the main UI for the installer, or it shouldn't be shown at all. Don't interrupt the user unless there's an error. It /has/ to go. Speaking of the toolbox installer; it appears underneath that top-level, non-movable, chromeless window. I can't even read it unless I move the dialog box. Again, bad UI. Do the detection for Visual Studio before starting the installer process to avoid this kind of interruption in the middle of an install action. What if I can't quit Visual Studio now because I'm in the middle of something? Do I cancel? What happens if I cancel? Will RadControls uninstall completely or will I just miss out on the toolbox? On the plus side, the custom install lets me skip installing the live demos. That's good. I've been a customer for three years, and you guys have a great demos web site... I don't need the demos installed locally. Those are my comments, do with them what you may... thanks for the ongoing blog work, by the way, I do appreciate it a lot. Thanks for the great feedback. Some of your comments make perfect sense (like the full-screen install background). Couldn't agree more. We'll definitely address these issues and make sure the installers are as fast and powerful without the "bad UI" issues you mentioned.